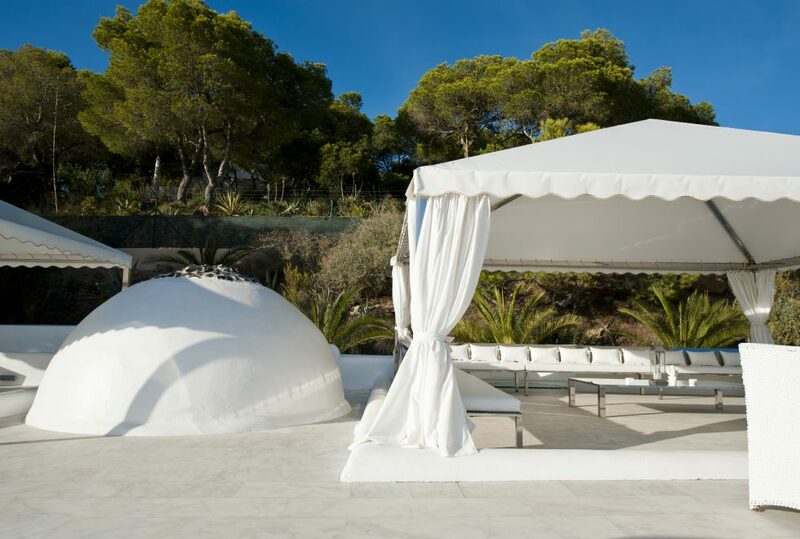 Villa Rica is a grand villa above the beach overlooking the Bay of Cala Jondal, arguably the coolest and most exclusive bay on the island, with its variety of chic beach bars and restaurants. The famous Blue Marlin and Tropicana Beach are just in front of the villa, where one can relax on a sun lounger in the sand, while being served cocktails and wonderful food. Cala Jondal is the only bay on Ibiza designated a marine preserve, and Dolphins can often be seen in the crystal clear waters (as well as some the worlds most incredible super yachts). An incredible location. At Villa Rica offers the services of a 5 star Hotel, with the exclusivity of a private villa. The butlers can prepare a selection of local organic ingredients and locally caught fish, as well as cocktails, fresh juices and canapés, they cater to your every wish, 24 hours a day. On the lower ground floor there is a small underwater bar and disco, with subaquatic pool windows and Technics decks, creating your own private after-hours club.